Home > Adam's Blog > Adam's Updates > What Are The Symptoms Of Bacterial Endocarditis? My inbox just received an email that I can relate too. Before I dive straight into the answer, you should know that I was initially diagnosed with a bicuspid aortic valve as a little boy. I think I was five years old when I learned about my heart murmur. From that moment on, I had to pre-medicate every time I saw the dentist. My mom told me it was very, very, very important to take medication every time I went for a cleaning or a cavity filling. Now, I don’t like the dentist to begin with… So, this just added to my resistance. At the time, I had no idea that my parents and dentist were protecting me from the problems of bacterial endocarditis. 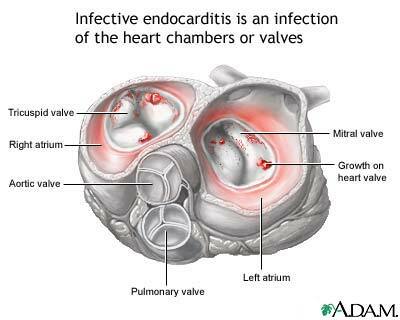 For those of you who don’t know, bacterial endocarditis is an infection of the heart’s inner lining (endocardium) or the heart valves. Problems of bacterial endocarditis can damage or even destroy your heart valves. According to the American Heart Association, there are about 29,000 cases of endocarditis diagnosed a year. Now that we all know what bacterial endocarditis is, I can get back to the original question, “What are the symptoms of bacterial endocarditis? Is chest pain a symptom of endocarditis?” Fyi, symptoms of endocarditis may develop slowly (subacute) or suddenly (acute). Fever which may be present on a daily basis for months before other symptoms appear. Small dark lines, called splinter hemorrhages, may appear under the fingernails. Murmurs result from changes in blood flow across valves when clumps of bacteria, fibrin and cellular debris, called vegetations, collect on the heart valves. The mitral valve is most commonly affected, followed by the aortic valve. In review of these symptoms for bacterial endocarditis, my research did not indicate chest pain as a symptom of bacterial endocarditis. However, I would suggest additional research if you are nervous about your condition. Adam – In response to Cheryl’s concern for patients knowing about endocarditis, I wanted to add that my Dad also got this infection in March of 2009. It was consistent high blood sugar readings for three plus days that brought him to the emergency room. He is a type 1 diabetic who was able to manage his glucose levels very well on an insulin pump but no matter what he did (including fasting), nothing kept the numbers from rising. We had no idea that this was a sign of an infection but we quickly learned an awful lot. I have had endocarditis twice. The first time we could not determine the cause. The second time happened because I went to the dentist when I got out of the hospital (In 1968 you had to spend at least five weeks in the hospital in order to take 20 million unitis of pencillin by IV a day) I went to the dentist. I told him that I had just had SBE (Subacute baterical endocrditis, and had spent almont two months in the hospital. He replied “I think that we studied about that in dental school.” He proceeded to clean my teeth without any type of protection. In less than two months I was back in the hospital with endocarditis. This time my aortic valve was damaged so badly that the Dr. said I would have to have my Aortic valve replaced. I was only 26 years old, and in very good physical condition, so it was eight years before I had to have my valve replaced. The Bjork-Shiley valve had just been developed, so Dr. John Kirkland at the University of Alabama Hospital in Birmingham used it, instead of a cadaver valve that he had planned on using. That was on November 22 1974. Because it is a mechanical valve, I have been on Coumadin every since. I have been very lucky and have not had any real problems with the Coumadin. I would be happy to discuss my Coumadin experience with anyone that is facing a long term course of Coumadin. As far as the symptoms of endocarditis, They are often very difficult to detect. I spent about four months going to the Doctor with continuious low grade fever, night sweats, fatigue, general discomfort, malaise, and splinters under my finger nails. It was only after I changed doctors (I choose a very young doctor recently out of medical school, and he determined after about 45 minutes of through exam that I had a blood infection. He sent me to Vanderbilt Hospital, where they grew cultures in about three days. I then spent two months in the hospital, the first 20 days flat on my back. I could not even raise my head or get out of bed to go to the bathroom. They changed my linens with me in the bed. I had an IV going 24/7. They did not do a pick line, or a cutdown, but used metal needles. The location of the IV had to be changed every two or three days. I was taking 20 million units of penicillin a day. After I completed the penicillin regiment, I had to spend several more days in the hospital. I had to have physical therapy because I had been so inactive. I’m a fellow mechanical valve replacement recepient, I have a St. Judes mitral valve and I waundering how your long time battle with coumadin is fairing? I was born with a congenital disease hyperthrophic cardiomyopathy. At 32 I had open heart to shave the left ventricle wall (septal myoctomy) and as an extra bonus I also had a valve replaced as well. Now I too be take coumadin. mr.collins can i have your email address? im in line to have valve replacement for second time. this time it is result of endocardities, im very depressed and need to hear a same case experience, thx in advance. I read the e-mails with interest but i just want to ask a question. I had been told many years ago that i have a ‘slight’ murmur and whenever doctors listen to my chest for whatever reason i see drs. tend to do a double take but don’t say anything which over the years i have now ignored. What i want to know is i only have some of the symtoms you mention above. I get blood splinters (splinter heamorage) on my nails which is quite painful for a day every now and then. I had quite a stresfull few weeks and suddenly the splinters appeared again together with a kind of dull numbing now continuous pain on the left side of my chest, (L) arm and behind my shoulder blade. I don’t have fever and i don’t think i am anemic. The night sweats i’m also not sure about because i am 51 and night sweats come with the territory. I get tired but i wrote that off to being older now and i don’t get headaches that often but if i do i think it might be because i’m stressed. Sorry i waffled on but i just want to know whether is should be concerned seeing i do not have all the symptoms only some. (I googled the splinter heamorages i get under my nails – and the result i got was endocarditis) Do you get different types ? I am male, 34 years old, in 2010 I was diagnosed with (subacute bacterial endocarditis) streptococcal infection and with bicuspid aortic valve. I was admitted to hospital for 3/weeks received antibiotic via IV and followed by an open heart surgery replacing the Aortic Valve with a tissue vale. I am much better post-op however, I have joint and bone pain for the past 7 months. My operation was in Jan 2010 and the joint/bone pain began in May 2010. Is this a common problem post endocarditis/heart surgery? Has anyone experienced body aches or joint pains post-op? p.s I have seen and examined by a rheumatologist who said that I don’t have any signs Arthritis and all my blood tests are normal. I am 51 and I have the same story. But added to yours I have a dull heaviness on the left side of my chest. But I do have headaches as well. Also spleen hurts. So far it has been explained by two different Dr.s with I am fat and old. Or hormonal and yes all in my head. I am convinced that I have endocarditis and that once you reach a certain age that it is not dealt with. Like getting cancer when your over the age of 72. I could be wrong. But I took out some old antibiotics given to me as a precaution for dental work and I feel better when on them. I have no symptoms while on them. I went off them and symptoms returned after 4 days. and again went away with more antibiotics. I am not sure what I will do when I run out. I figure I’ll just die of an embolism or heart attack. I read a book that stated all finger hemorrhages are heart related. I had visible signs of arthritis in my knuckles and went to a doctor (Dr Fisher out of Houston Texas) who said I was wasting his time. It took another ten years for other tests to come back positive for rheumatoid arthritis. So just because the tests say you don’t have it does not mean they are reliable. I have an appointment for next Monday to discuss my options. I would appreciate any thoughts you may have to my problem. My name is Mark. I was diagnosed in 2010 with Bacterial Endocarditis after many misdiagnosis. My symptom was a 103 fever and bed sweats for 30 days. during that time I lost 35 lbs and lost my job, had no insurance. I was treated for the flu twice. Then diagnosed with dinghy fever. Then swine flu. Then Malaria. Finally, a GP who just started attending the church I went to, agreed to see me. He sent me to 2 different hospitals for blood cultures and to see a cardiologist for a echo cardiogram with contrast. The cardio said that there was nothing wrong, with my heart ,but suggested I be treated for tropical fever. The GP thought this guy was nuts. 72 hours later, I was diagnosed and then came time for treatment. In patient for 30 days was out of the picture for me cause I had no insurance. So we contacted the makers of Rosephin and they donated 30 day supply to me. I found a pharmacist to compound the meds, and then a hospital to install a pick line. Then, I sat at home and gave myself 3 grams of meds a day for 30 days. I paid a home health nurse to come and change my dressings once a week. and to take it out at the end to have it cultured. I was cured, so I thought. 6 months later, after I found employment and health insurance, my chest started to ache. A pinpoint pain was causing me to be concerned. I made an appointment with a well known cardiologist who ran me through a battery of tests. I started getting tunnel vision when I ran /walked the treadmill. He later did an echo cardiogram and discovered a lot of regurgitations of the Mitral and Aorta valves. Insurance had a disclaimer about not covering pre existing conditions for a year , so the Doc kept me alive while I waited for surgery. One year and one week after the pre-existing clause was over, I had my surgery. I went to the Kirkland Clinic and had 2 Onyx valves installed by an Aussie, who has since returned to his motherland. I self test my INR weekly, and buy my strips online so I can afford them. I am coming up on 2 years post op. I am going to see my oldest daughter graduate with honors from High School this evening. Other than gaining weight, I have no complaints, only gratitude for another day. Yes, there are tough days, but most are good. And I am grateful to be among the living, but ready to leave if need be. I was wondering if anyone could share their experience of sub-acute endocarditis with me. Anyone that didn’t feel well for months (fatigue and sick with fever every now and then)? Anyone that had a good echo and after months diagnosed with endocardits? How long did you feel weak after months of not feeling well, six weeks of anti-biotics, and open heart surgery? Any deppresion during pre and post endocatditis? I have a few abseses from iv drug use, I have drained 2 of these at home, have been cleaning with sallen, alcohol and anti bacterial soap. I have 2 others that I haven’t drained, nor will I. I do not have a fever, sometimes I get dizzy when I stand up. I have had some minor night sweats, but I am also sleeping with a long sleeve shirt and pants as I do not want my wife to catch this infection and we have a 5 year old who will come into our bed at night and I do my want either of them to catch it. And they aren’t “super soaker night sweats” I do wake up to pee 1-2 times a night but a lot of these symptoms are things I was expierance before I had even 1 abseses My appetite is fine, I do have pain where the infection site is but I believe that is just from the mass under my skin. My chest does hurt but I don’t know if I would consider it “chest pains”. Can anyone with expierance please describe what the chest pains feel like? Is it like a heart attack pain? Like an elephant standing in the chest or is mild to minor discomfort in the chest area the kind of chest pains that would be enough to prompt medical attention? Can someone describe what the chest pains felt like that were a symptom of endocarditis? Could you describe to me what the chest pains felt like? How sever were they? Or were they mild and dos they come and go? Can you describe what the chest pains felt like? Was it intense and sever or mild and dos it come and go? My assumption is that the chest pains related to endocarditis that are cause for worry are similar to a heart attack , the feeing if an elephant on your chest. When i read that chest pains are a symptom I envision sever very painful discomfort on your chest. Thanks for your help. I have a staff infection and it has spread but isn’t spreading, no read streaks and it is getting better. I do not have many if any of the symptoms described. No fever, no caugh, at times I do have a shortness of breath, sometimes i get dizzy when i stand up. My appetite hasn’t changed. I do have a caugh, but I just got over bronchitis, and I am a smoker. I have some discomfort in my chest area but it isn’t sever constant pain. It comes and goes. I do get some night sweats but I h e been sleeping in a long sleeve shirt to reduce the risk of my family catching the staff from the bed sheets and these aren’t the “super soaker night sweats” that been described. Very mild. No blood in urine, no splinters in finger nails, no red streaks growing up and towards my heart or major arteries from the infection or absese site. It does hurt quit a bit but there is a large mass under my skin. I have 2 that are just lumps that I won’t touch. But there were two others I drained by squeezing and I am nervous after reading you should never do this. As it can cause it to spread. I have been covering open wounds with mepalex bandages, and cleaning with alcohol, sallen, and frequently using anti-bacterial soap. As well as being very cautious. I use one towel and wash rag for the infected area, I also wash those towels and wash rag frequently and by them selves with bleach and detergent. I do not have most of the symptoms but I do have some and I clearly have staff or mrsa I want to avoid a er trip but I do not want to lose any limbs or even worse weaken my heart or put myself in a situation where I need heart surgery or even worse could die. Please help. Can you describe what the chest pains felt like? Was it intense and sever or mild and dos it come and go? My assumption is that the chest pains related to endocarditis that are cause for worry are similar to a heart attack , the feeing if an elephant on your chest. When i read that chest pains are a symptom I envision sever very painful discomfort on your chest. Thanks for your help. I have a staff infection and it has spread but isn’t spreading, no read streaks and it is getting better. I do not have many if any of the symptoms described. No fever, no caugh, at times I do have a shortness of breath, sometimes i get dizzy when i stand up but that would happen before I had any bumps you know when you stand too quickly. My appetite hasn’t changed. I do have a caugh, but I just got over bronchitis, and I am a smoker. I have some discomfort in my chest area but it isn’t sever constant pain. It comes and goes. I do get some night sweats but I h e been sleeping in a long sleeve shirt to reduce the risk of my family catching the staff from the bed sheets and these aren’t the “super soaker night sweats” that been described. Very mild. No blood in urine, no splinters in finger nails, no red streaks growing up and towards my heart or major arteries from the infection or absese site. It does hurt quit a bit but there is a large mass under my skin. I have 2 that are just lumps that I won’t touch. But there were two others I drained by squeezing and I am nervous after reading you should never do this. As it can cause it to spread. I have been covering open wounds with mepalex bandages, and cleaning with alcohol, sallen, and frequently using anti-bacterial soap. As well as being very cautious. I use one towel and wash rag for the infected area, I also wash those towels and wash rag frequently and by them selves with bleach and detergent. I do not have most of the symptoms but I do have some and I clearly have staff or mrsa I want to avoid a er trip but I do not want to lose any limbs or even worse weaken my heart or put myself in a situation where I need heart surgery or even worse could die. Please help. I hope you get some news, and good luck! ones, i have pictures to prove that… They tested positive for MRSA.